Suzuki SX4 Pros and Cons | Page 1 of 3 | Why Not This Car? What drives people to buy (or not buy) a certain car? 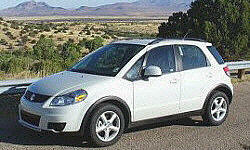 TrueDelta's members share Suzuki SX4 pros and cons based on their real-world driving experiences. Do you want a car that no longer has dealer support in the United States? Do you want to own a car that nobody knew existed? Do you like hatchbacks? What about different shades of plastic? Peppy small car with lots of interior and trunk space. I was going to buy another Subaru Forester but parts are expensive and the vehicle is a little larger than I need. For my purposes of driving alone on mountain roads and carting building materials, the SX4 was cheaper and actually does a better job in the snow. 17" wheels with Dunlop mud/snow tires (standard for this vehicle) for good all weather road grip plus 4 disc brakes with ABS provide excelent braking for any situation. All wheel drive option. 4 Wheel disk brakes stop in an instant. Handles like a high end sports car. Grips the road. Smooth ride with 4 adults on board. $13K for demo model with 10k miles including tech package. Sporty and small but still aggressive. I like the fact that this car is 4WD, but allows you to switch to 2WD. I also like that it comes with alloy wheels rather than plastic hub caps that squeak. Low price for AWD and standard/optional equipment. However, less so now than when I purchased it (10/09). Subaru Imprezza probably better value. Even being all wheel drive, I usually achieve around 33-34 highway. Very inexpensive compared to the price. The exterior is very smooth and flowing, It catches the eye and stands out.